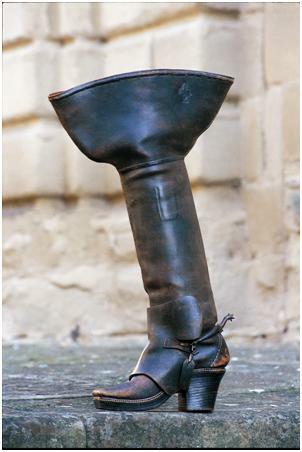 Musketeer boot, France, 17th century. The International Shoe Museum, Romans-sur-Isère. Mule, unsuitable for walking, in black kidskin and sky blue satin, small cabochon in porcelain, Vienna, c. 1900. Height of heel: 20 cm. 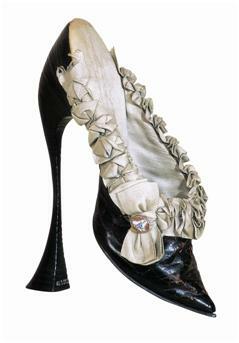 Guillen Collection, The International Shoe Museum, Romans-sur-Isère. 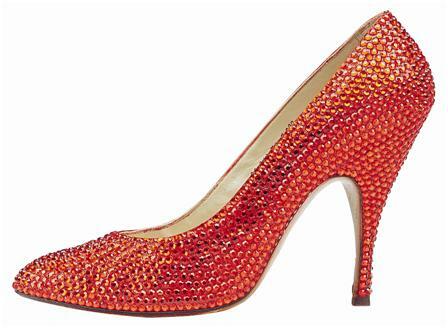 “Low-cut” pumps of Marilyn Monroe decorated entirely with red Swarovski strass. Created by S. Ferragamo for the film Let’s Make Love, directed by George Cukor in 1960. Once upon a time my friends wanted to go out for the evening; I didn’t want to open my closet, because it can get very taxing as a 20-something, even if she doesn’t care that she’s seven years out of style. I sent a nearest and dearest to do my dirty work. She called out, “Do you want to wear black … or black?” Noting and making fun of the fact that my wardrobe was by and large black. I’m not Goth, not that there’s anything wrong with anyone that is, I just happen to think black is complimentary to everything else I’ve got going on. All of that said, Jean Paul Gaultier the designer does not stir any excitement in my brain or gut. I do not feel the need to overcharge my credit card or make sure I grab the latest magazines with his newest lines in them. However, Jean Paul Gaultier the man is a man among men, a hero for anyone that’s ever tried to fit in, and for that, I salute him. Persistently causing a stir from the mid 1970s until now, Gaultier keeps the world guessing as to which multicultural controversy he’ll strike next. Performing artists and film makers all vie for his talent and creative eye (Madonna, Marilyn Manson, and Luc Besson to name a few). And who could blame them? This enfant terrible stands up for what he believes in and is not ashamed to do so. Unlike Gaga, though, his outbursts do not irritate me to a point of soundless fury. See all of his glory at the de Young Museum’s The Fashion World of Jean Paul Gaultier: From the Sidewalk to the Catwalk through 19 August 2012. And while you’re envisioning yourself in his latest trends, grab The Art of the Shoe to try and coordinate colours and styles.